Thinning the ends of your hair is an easy way to establish healthier looking hair. 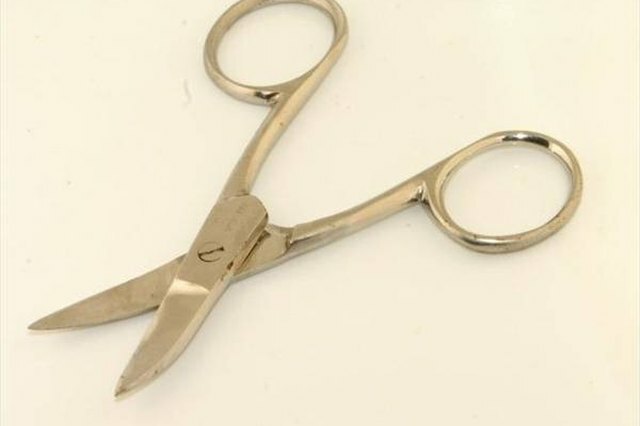 Using scissors, you can perform a thinning technique which will cut every few pieces of your hair slightly shorter than the rest. Not only will it remove all split ends, it will also create a natural looking texture. If you have layers, thinning the ends of your hair can rejuvenate your layers. Wet your hair for easier handling. Freshly washed hair with no product makes the easiest surface for you to work with while thinning the ends of your hair. After you wash your hair, towel dry all of the excess water. Brush through your hair to remove any tangles. Section your hair. If your hair is layered, you will need to section your hair according to each layer. Each section of hair should be all the same length. Use hair clips to hold off each section. If your hair isn't layered, simply section off the bottom, middle and top layers of your hair using clips. Gather pieces of hair within one section. Work with one sectioned off area of hair at a time. It is best to work with the bottom sectioned layers first and work your way up. Release one section of your hair from a clip. Brush through the hair you've released with your fingers. Gather thin pieces of hair at a time between your middle finger and index finger. Thin the ends of your hair. Slide your fingers down the strands of your hair that you have gathered. Slide your fingers until there is only about an inch of hair remaining on the other side of your fingers. With your other hand, use the scissors to cut vertically into your hair. Refrain from cutting horizontally; that will just shorten your hair and not successfully thin it. Start from one end of the gathered hair between your fingers. Use sharp chopping actions quickly moving your way from one side to the other. This will ensure that you cut every few pieces of hair about half an inch shorter, thinning out the ends of your hair. Continue until you have finished thinning the bottoms of the entire section of hair. 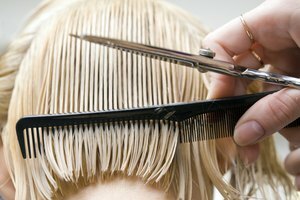 Once you have finished thinning your first section of hair, move on to the next session. Repeat Steps 3 to 5 until you have successfully thinned all of your hair.